Helping children and young people in conflict zones build leadership, peacemaking skills, and resilience to extremism through grassroots music education. So many children need your help Today! 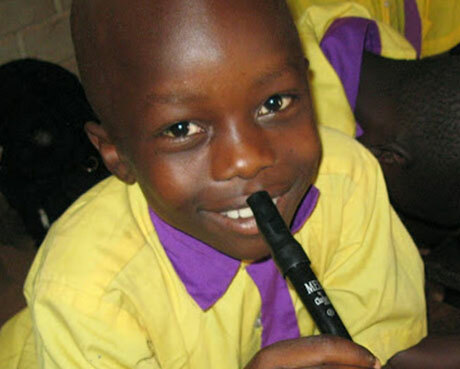 Learn what you can do to help us teach peace through music. Teacher Discovers Surprising Path to Peace The daughter of a Vietnam war vet who can’t shake the memories of her childhood becomes a music teacher, but then hears a new calling — help refugee children — and gives up everything to follow it. The war in Kosovo ended in 1999, but the affects of this war --Poverty, Intolerance, Segregation, Racism--are experienced every day, especially by children raised in camps and those living in minority communities. 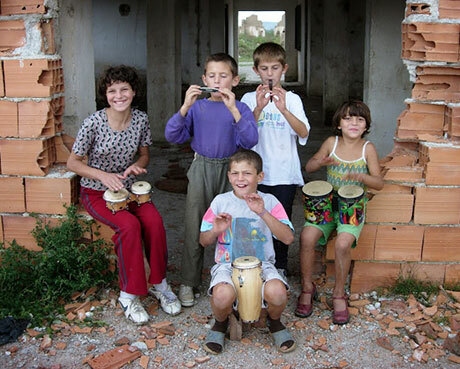 SMF is working with the children and teenagers of Kosovo to develop self esteem, tolerance, and a love of peace through music. Northern Uganda is recovering from a brutal civil war in which 20,000-200,000 children were abducted and forced to become child soldiers. Over 1 million people were forced to live in IDP camps, where they experienced malnutrition and extreme poverty. Many people continue to live in these camps even though they are closed. SMF is working with children, teenagers, and young adults who were child soldiers as well as children born while their mothers were abducted, building tolerance, peace, and especially self worth through music. Northern Ireland continues to be 95% segregated between Catholics and Protestants. Bombs explode or are discovered weekly, and riots take place monthly. Murals of men wearing balaclavas and holding guns are on homes and businesses everywhere. Children and adults alike suffer from low self esteem as they experience anger and violence daily. SMF is working to bring children together from both sides of the community, forming life-long and life-changing relationships through music. The war in Syria is at the root of the worst refugee crisis since WWII. Children are being both targeted and recruited, and families have left Syria by the millions. SMF is building a program not just for Syrian refugees. but also Kurdish, Afghan and Yazidi children and teenagers-- all in Greek refugee camps. The program is providing structure and much-needed opportunities for acheivment and self expression. The children we serve depend on your donations! Please consider donating and help us continue teaching peace to children in need around the world.